Home > Latest News > Soil, Stories from the Field > Stories from the Field – Don’t Guess…Soil Test! If you have a garden or have tried to grow grass in Pike County, you are aware of the challenges provided by Pike County soils. Pike County’s soils are mostly derived from glacial till, providing a mixture of clay, sand, gravel and boulders. Some of these soils have a restrictive layer, like clay, making them poorly drained. Pike County’s growing season is short due to our northern latitude and elevation. All of these factors make it difficult to effectively establish vegetation. Performing a soil test is the best way to determine soil fertility and achieve your goals in gardening, lawn establishment or any crop growing endeavors. Soil fertility is usually defined in terms of the available levels of macronutrients that plants need for optimum growth. Primary plant nutrients include Nitrogen (N), Phosphorus (P) and Potassium (K). Secondary nutrients include: Sulfur (S), Magnesium (Mg) and Calcium (Ca). Micronutrients: Iron (Fe), Manganese (Mn), Boron (B), Chlorine (Cl), Zinc (Zn), Copper (Cu), Molybdenum (Mo) and Nickel (Ni). A balance of all of these nutrients is crucial for healthy plant growth. 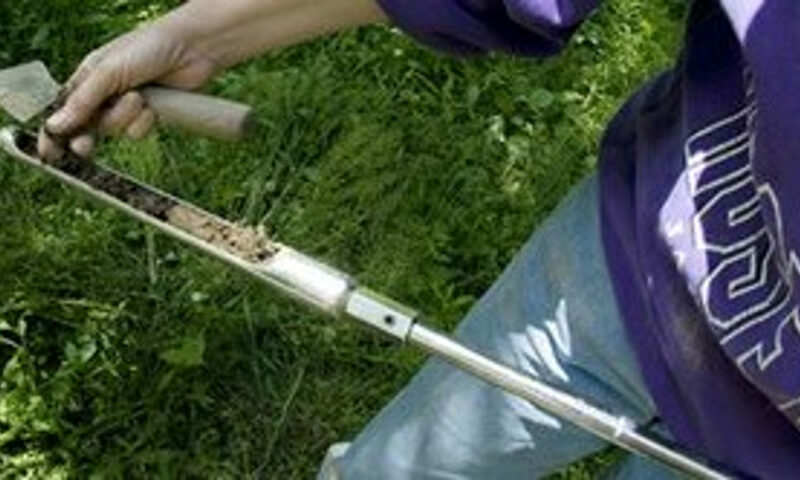 Penn State Cooperative Extension has a soil fertility test which can serve as a soil management tool for homeowners, farmers or others interested in determining the fertility of their soil in order to optimize nutrients and growth of their gardens or lawns. Soil test kits are available for $9. Each soil sample is analyzed for parameters such as pH, lime requirement, phosphorus, potassium, magnesium, and calcium. The soil test report includes this chemical analysis of the soil along with lime and fertilizer recommendations for the crop which the landowner is growing. More detailed soil specific testing can be requested from Penn State for an additional charge. Soil test results are accompanied by recommendations based on the crop you wish to grow. The goal is to create optimum soil physical and chemical conditions that encourage plant growth and supply the required nutrients in the amounts and at the times they are the most needed by the plants. A soil amendment is any material added to soil to improve its physical or chemical properties. Physical properties, such as water retention, infiltration or structure can be changed by adding inorganic or organic material. Vermiculite, perlite, pea gravel and sand are examples of inorganic materials. Organic material would include sphagnum moss, wood chips, compost, manure or grass clippings. Organic soil amendments improve all soils by providing for the soil microbes and animals. Worms, bacteria and fungus slowly release nutrients, decrease compaction and provide all sorts of valuable functions. Whether organic or inorganic, these physical soil amendments should be thoroughly mixed into soil for the greatest benefit. Due to predominately acid soils, the first recommendation from the Pike County soil test results is often to raise the pH of the soil to create favorable soil conditions for productive plant growth. A chemical soil amendment such as lime (calcium carbonate) can be added to the soil to move the soil to a more neutral pH. It is important to research the pH preferred by the plant you are wishing to establish. Most vegetables and legumes prefer a pH around 6.5, while blueberries and potatoes prefer a more acidic soil of 4.0-5.5. Whether you are trying to grow tomatoes in your garden or establishing a lawn after building a new house, determining the needs of your soil is crucial for healthy plant growth. The addition of soil amendments, such as lime or compost, in the correct proportions can save time and money and have you enjoying green vegetation in no time!